Cory Lykins started at First Network Group in May of 1998 after answering an ad for one of our end-user technical support positions. Before that he studied at the University of Northwestern Ohio in the areas of Business Administration and Marketing. His interest in computers had been life-long however, since his first TRS-80 computer at the age of ten. This interest led him to seek a job in the IT sector and ultimately with us. After only a few short months, Cory was already handling off-hours supervision. This expanded into taking over the roll of Second Level Supervisor of the Technical Support Department under Darren Ankney. Together they crafted and maintained many of the internal software systems and procedures here at First Network Group. 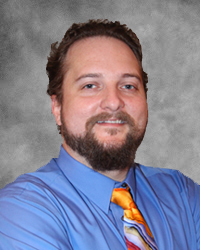 Cory is adept at HTML, CSS and graphics work and works on the front-end of many of our products and systems. Cory possesses a genuine willingness to make sure everyone can get the most out of technology to communicate and better their lives. His ability to quickly analyze situations along with a vast knowledge of internet-related applications and operating systems led him to become the Vice President of the Technical Services department in September 2001. His biggest challenge has been transitioning from hands-on technical work to employee management but it has also been his most rewarding. He enjoys seeing a new employee begin and learn and have the opportunity to grow, learn and thrive in the company just as he was allowed to do. Cory’s vision for the company is to make sure we continue to provide the same top-level service that we always strive for while maintaining the family atmosphere of our company as we continue to grow and expand.